Typically, a printed letter is reserved for the most important of job-related or other professional communications: recommendation letters, cover letters, resignation letters, legal correspondence, company communications, etc. Since it's such a formal mode of communication, you'll want to make sure you know to format a letter. Proper formatting is especially important if you're sending a hard copy to the recipient rather than an email – the letter needs to fit the page properly and look good. Dear Mr./Ms. Last Name: (Use a formal salutation, not a first name, unless you know the person extremely well. If you do not know the person's gender, you can write out their full name. For instance, you could write "Dear Pat Crody" instead of "Dear Mr. Crody" or "Dear Ms. Crody." Note that the person's name is always followed by a colon (:) in a business letter, and not a comma. If you do not know the recipient’s name, it’s still common (and safe) to use the old-fashioned “To Whom It May Concern:”). The first paragraph of your letter should provide an introduction as to why you are writing so that your purpose is obvious from the very beginning. Then, in the following paragraphs, provide more information and specific details about your request or the information you are providing. The last paragraph of your letter should reiterate the reason you are writing and thank the reader for reviewing your request. If appropriate, it should also politely ask for a written response or for the opportunity to arrange a meeting to further discuss your request. This is a letter example. Download the letter template (compatible with Google Docs and Word Online) or see below for more examples. I’m writing to resign my position as customer service representative, effective August 15, 2018. I’ve recently decided to go back to school, and my program starts in early September. I’m tendering my resignation now so that I can be as helpful as possible to you during the transition. I’ve truly enjoyed my time working with you and everyone else on our team at LMK. It’s rare to find a customer service role that offers as much opportunity to grow and learn and such a positive, inspiring team of people to grow and learn with. I’m particularly grateful for your guidance while I was considering furthering my education. Your support has meant so much to me. Please let me know if there’s anything I can do to help you find and train my replacement. If you're sending an email letter, here's what to include and how to format your signature. When writing a letter, your letter should be simple and focused, so that the purpose of your letter is clear. Single space your letter and leave a space between each paragraph. Left justify your letter. Use a plain font like Arial, Times New Roman, Courier New, or Verdana. The font size should be 10 or 12 points. Leave a blank line after the salutation and before the closing. Business letters should always be printed on white bond paper rather than on colored paper or personal stationary. Be on the lookout for formatting errors as well, such as two paragraphs that don’t have a space in between, or lines that are indented incorrectly. Then before putting your letter in an envelope, don't forget to sign above your typed name, using blue or black ink. If you are using Microsoft Word or another word processing program to write your letter, there are templates available that can help you format your letter correctly. Here’s more information on free Microsoft Word letter templates. 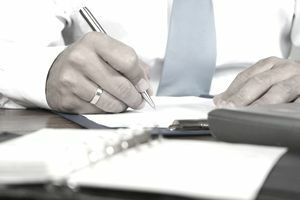 Start with the basics on how to write a business letter using a general format and review various business letter templates. In addition, you can look at these employment related business letter examples. Review more details about formatting and take a look at another example of how to format a business letter. If you like to learn by looking at examples, there are many types of business letters to choose from, such as cover letters, interview thank you letters, follow-up letters, job acceptance and rejection letters, resignation letters, and appreciation letters. You’ll find all those and more business and employment-related letter samples in this review of letter samples. Not all business letters are printed out and mailed, so it’s important to review these guidelines for professional emails and letter writing.